Sitges has wonderful beaches, sun, trqnuility, and it's located only a few kilometres away from Barcelona, the Catalan capital. We have done a selection of our favourite beaches to help you choose where to go if you decide to go to a getaway and come to Sitges. Are you looking for a quiet and beautiful town? Sitges is a small coastal town, right next to the Mediterranean Sea, and it has a lot to offer. Are you in need of sun? Well, Sitges is the answer again, with 300 sunny days per year. 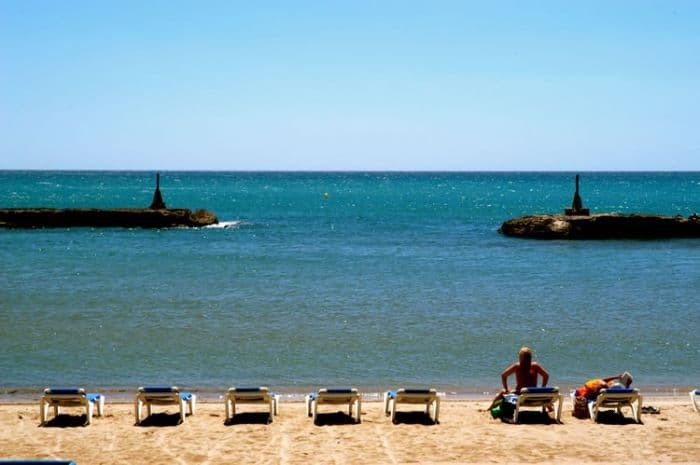 In case you are wondering what to do during these sunny days, let us tell you that Sitges has 17 wonderful beaches. Here you have a selection of our favourite ones. This beach has 3 small coves and they are located between the harbour and the urban core. The Balmins beach is mainly nudist, especially the side closest to the port. The width of this beach varies every year, depending on the winter storms. It has all the services needed: lifeguard, umbrellas, deck chairs, access ramp, etc. The Platja de Sant Sebastià is a small urban beach perfect for families, located to the east of the Sitges church, between the old town and the leisure harbour. This beach has all the facilities you may need, including an access ramp for people in a wheelchair. Just like the Sant Sebastià Beach, this one is a small urban beach. The Nautical club is there, and it also has volleyball nets and football pitches. That's why the Fragata is considered a sports beach and several competitions take place there every year. You won't find umbrellas or deck chairs but there is lifeguard, showers, a beach bar and an access ramp. The Ribera Beach is one of the larger beaches of Sitges and it can also get very busy. This urban beach is really close to the town and it also counts with all the facilities anyone might need during a day at the beach. The Bassa Rodona Beach is located between the Ribera and the Estanyol Beach. It counts with all the services needed and it also has the Club de Mar (Sea Club), for sea sports, such as sailing. This is the main gay beach of Sitges and it's also one of the busiest. Long beach located in front of the residential are of El Vinyet. It has all the services: umbrellas, parking, lifeguard, showers, access ramp, toilets, and more. Another long beach, just like the Estanyol, only this one is narrower. It is also located opposite to the El Vinyet neighbourhood. It has 2 beach bars, umbrellas, deck chairs, and other beach items available to rent. The Barra Beach is a large urban and family-friendly beach. Just like all the others, it has an access ramp, and it also counts with lifeguards, a beach bar and rental services for awnings, umbrellas, and deck chairs as well. Towards the west, you can find the Anquines Beach. It is a small, secluded beach, flanked by breakwaters. The calm waters are perfect for children to play and swim. This beach has the usual main facilities: beach bar, lifeguard, deck chairs, umbrellas, etc. A small nudist beach, popular amongst gay people. It actually is two beaches in one: Home Mort and Roses Beach. It is difficult to get there because it is surrounded by cliffs, behind the Atlàntida club. Unlike the other beaches, it's not a sandy beach, it has pebbles. Due to its location, you won't find the services and facilities you usually have on the rest of the beaches. Images from SpainCoast and Visit Sitges.